As Thanksgiving is quickly approaching, I find that my heart is full of gratitude for our parish community. As many of you know and can now see, we have a beautiful new addition to our church. I have received a lot of wonderful comments, and I would agree, that things turned out well. Thank you to all of you who have supported the project to this point. I am also grateful that we matched the $25,000.00 matching grant over the course of the summer, and I am grateful for the success of our first "Growing Together As One" fundraising event. It was a fun night and we were able to make a clear profit of approximately $20,000.00. We are already starting to plan for the next event. With the building phase close to completion, we now look to pay off our new addition over time. As I mentioned in a previous letter, my hope is to pay off the addition within five years. This is the goal we stated to the Diocese of Duluth. With building projects, changes are expected. Because this is the case, people often financially account for changes, usually planning for an additional 10% of the total cost of the project. Our changes ultimately amounted to around 7% of our total cost. All this being written, including the fundraising mentioned above, our balance to pay off the new addition as of November 7, 2018, is approximately $167,512.00. There are other items we will still purchase that were not included in the building project plan, such as cabinets for the vesting sacristy. 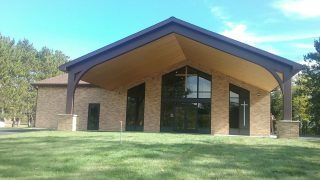 We also have on our wish list--two tv's, speakers, closed circuit camera, and additional seating in the new narthex--all this to enable the narthex to be used for overflow crowds during the summer months. This letter is a simple update of where we currently stand. If you have other questions, feel free to call the office, talk to me, or ask a member of the finance council. I thank you again for your generosity. PS--See photo slideshow on our homepage or check out the photos in the photo gallery. If you'd like to help us by donating, click the donate tab to donate online or you may mail a donation to: Vision Building Fund; St. Emily's Church; PO Box 25; Emily MN 56447. Thank you for any help you may give--monetarily, volunteering, or praying for our parish. Father in Heaven, we are your children seeking to do your will. Help us to follow in the way of your Son, Jesus, and inspire us to continually make known your Kingdom on earth. Enlighten us through the power of your Holy Spirit so that we may understand how we must proceed in relation to our Vision Campaign. Aid us to continue our efforts in the spirit of generosity and increase our faith, hope, and love. As our parish expands, expand our desire to imitate Jesus. Through our witness, we pray that all people who pass through our doors may desire to enter into deeper communion with You. We give you thanks for your many blessings, and we ask the intercession of St. Emily, our patroness, who knew the joys and struggles of building projects for the sake of your glory and honor, and we make our prayer through Christ our Lord. Amen.